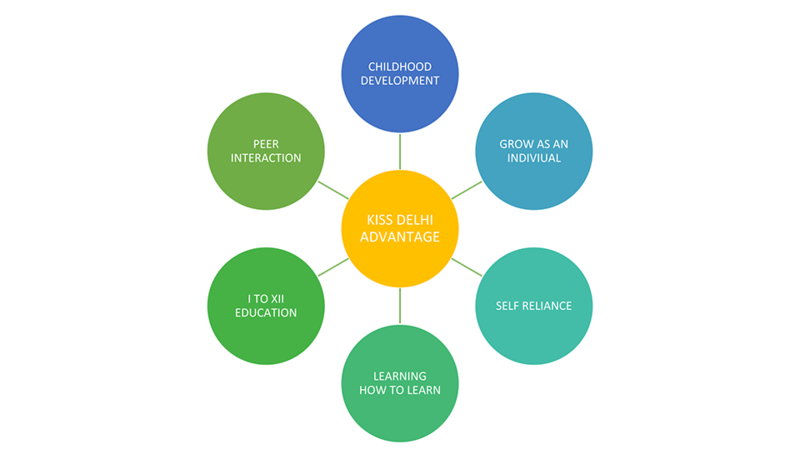 KISS Delhi School is a public service oriented, non-profit entity, established by a joint venture between government of NCT of Delhi and Kalinga Institute of Social Sciences, Bhubaneswar, Odisha being headed by CEO, KISS Delhi. The KISS model of education – Fully free formal education in a residential environment has been accepted by one and all not only from India but from abroad as the most successful model to eradicate poverty through education in underprivileged children. KISS the brain child of Dr. Achyuta Samanta, who has experienced poverty first hand after he lost his father at the tender age of 4 years realized that poverty is the biggest handicap a child can have. Dr. Achyuta Samanta having experienced poverty himself set a mission for his life to provide underprivileged children a level playing field in the form of a fully free residential school, and thus KISS was born in 1993 in Bhubaneswar with 125 tribal children in the form of Kalinga Relief Charitable Trust, which was later renamed as KISS. Today KISS Bhubaneswar has more than 22,500 children, making it the largest free residential tribal institute in the entire world. KISS Delhi is another step outside Odisha towards achieving Dr. Achyuta Samanta's vision. KISS Delhi is a joint venture of Govt. of National Capital Territory of Delhi & Kalinga Institute of Social Sciences, Bhubaneswar, Odisha. Bear the recurring and the non-recurring expenditure for a period of 5 years. Provided Land and Building for the entire duration of project beyond 5 years. Recurring cost of Rs. 5,000 per child per month for a period of 5 years for 1200 students. KISS Delhi would operate, maintain & manage the project. KISS Delhi would bear all the operational cost after 5 Yrs. The Department for the welfare of the SC/ST/OBC/Minorities, Government of NCT, Delhi is fully committed to the highest standard of excellence and transparency in providing the benefits to the people belonging to the above mentioned sections. A number of schemes are being implemented by Govt. of NCT of Delhi for socio-economic development of residents of Delhi belonging to these deprived section of the society and KISS Delhi is one among the several schemes which has been initiated for the development and upliftment of the underprivileged. Kalinga Institute of Social Sciences (KISS) is the “largest residential institute for the tribals (indigenous) in the world”, providing Accommodation, Food, Healthcare, Education from Kindergarten to Post Graduation, Vocational training and all other basic amenities of life absolutely free with a job assurance after completion of education. Kalinga Institute of Social Sciences (KISS), a protégé of KIIT University, Bhubaneswar, India has been acknowledged by many Statesmen, Diplomats, Social activists, Nobel Laureates, Chief Ministers and Senior Union Cabinet Ministers of India.